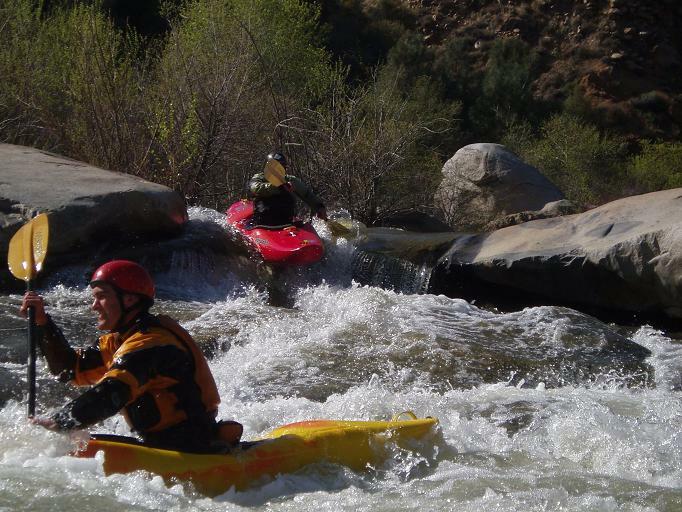 The most fun I had on the Kern on my first trip out there was this run. Normally class V, at the low flow of 540 it was more of a solid class IV run. There were only 4 big rapids, a few medium sized moves to make, and a bunch of busy water on this run, but the rapids sure made it worth while. 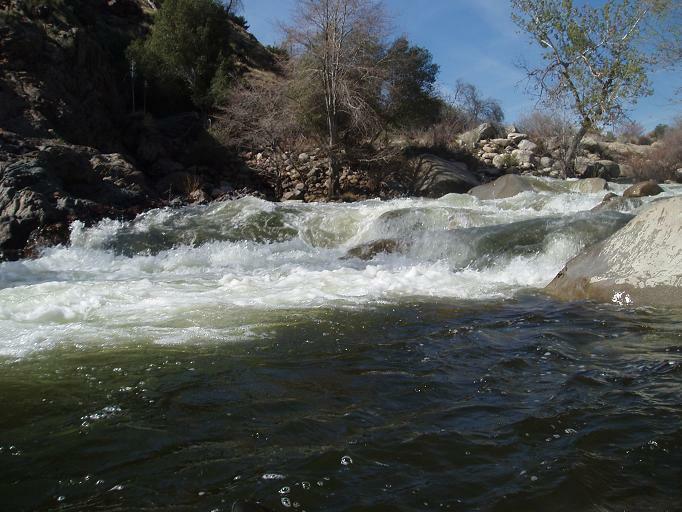 The first rapid was big, can be seen if driving down 155 towards Kernville. 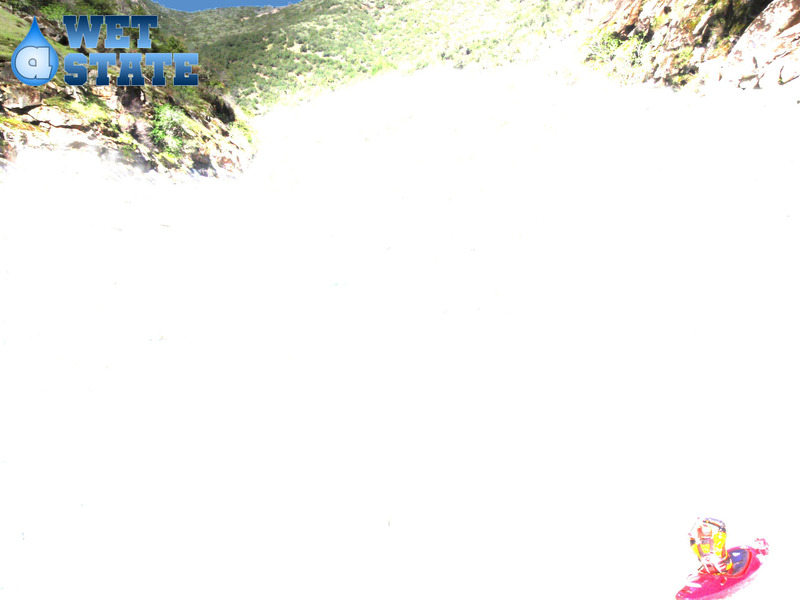 The last big rapid is also visible from the road. I would recommend this run for anyone in the area. Apparently people run the run up to 6,000 and beyond, but at that point most of it is avoided with sneak lines as the house size boulders make house size holes. A great run, the gem of the Lower Upper Kern. Again note that the ratings are for low water and I would for sure imagine it is a class V run at higher flows. Also, some guide books have this section included in the Goldledge Run, but the locals break it up this way, so that’s what I am doing. Squashed Paddler (IV-). Many holes and pour-overs, At our flows we ran from the left to the right and back to the left. I imagine at higher flows the hole river is filled with large stomping holes. Sock’em Dog (IV+). 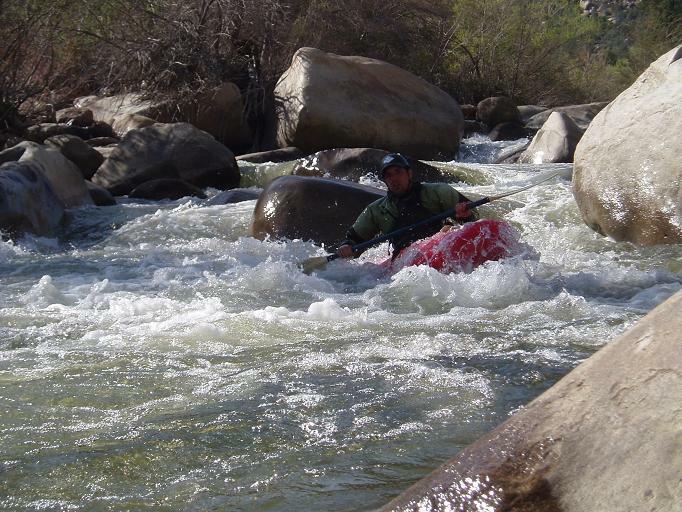 A stout rapid, with a good lead in. The lead in contains many holes to maneuver before driving right across the river to get to the right of the large midstream boulder. Run the chute between this rock and the shore. From there, straighten out and run the next horizon line straight down the tongue. Golf Course (III). A very long read and run boulder garden, no hard moves, just long. Bumpy (II+). I add this because the river is extremely bony but there is a decent way down. The river widens and then you will see a very small channel break off to the right by some brush. Follow it down the bumpy cascade, it is the best option. Boof or Avoid (III). Just below the bumpy mess comes a little horizon line. You can avoid it to the left, or you can do a boof against the right wall over a large hole. Stick it, cause even at the low flows the hole was pretty dang big. Flume (IV-). A long class III lead in leads to a pool. On the right shore, you will see a little channel going over a boulder, ride the slide down and then straighten out for the run out through a few smaller holes. Fender Bender (IV). 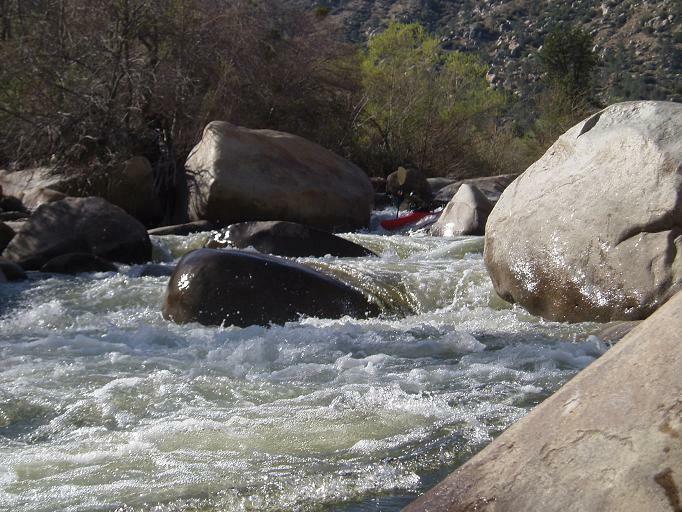 The last rapid on the run is a large boulder mess. You can boat scout it from an eddy on the right just into the rapid, or you can road scout it before hand. Run the chute on the right and then move left to finish with a boof over a hole. Take out: 4.7 miles past the Kern River Brewery look for Thunderbird camp and day use area on the left. Put in: Drive another 3.3 miles up 155 till you see a turn out on the right across from a large metal railing and day use area (same as Ant Canyon take out).